Our "On This Day in History" posts have been a runaway success. We started posting them last October and intend to post them for the entire year. Each post tells about an event that happened on that day during the American Revolution or during the founding period. At the end of the year, we intend to put them together in a beautiful full color coffee-table style book. In this issue of American Beginnings, we would like to highlight some of the most popular of these "On This Day in History" posts of the New Year so far. We also feature our usual Quote of the Month and Question of the Month and our unique Military Jewelry. Our most popular quote of the last month was from Samuel Adams. 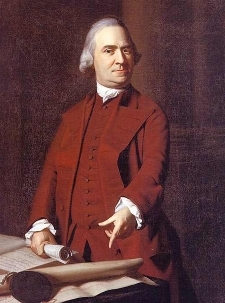 Samuel Adams was a leading figure in Massachusetts during the time leading up to the American Revolution. He was a leader of the Boston Town Meeting and the Massachusetts House of Representatives and was influential in rallying public support against British acts such as the Stamp Act. 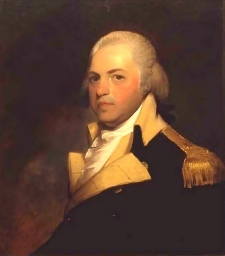 Adams was a primary creator of the "Committees of Correspondence" that coordinated information between the colonies. In 1768, he was elected by the Massachusetts legislature to pen a letter which was sent to the other American colonies urging them to cooperate and resist British encroachments on American liberties. The letter was so hated in Britain that it caused Parliament to occupy Boston, which led to the Boston Massacre, in which British soldiers fired on civilians during a protest. Adams went on to serve in the Continental Congress and signed the Declaration of Independence. After the war, he became the second governor of Massachusetts after John Hancock. Sam Adams said knowledge is a key to preserving liberty. Why do you think ignorance in the people would cause a loss of freedoms? When Adams says nations will sink when the people are "debauched in their manners," he means when they lose their moral virtues and become morally bankrupt. Why, in your opinion, would this lead to a nation "sinking" and losing its liberties? Learn more about Sam Adams here. Our most popular "On This Day in History" post of the last month was about the Presbyterian Church in Elizabethtown, New Jersey being burned down by the British on January 25, 1780. The church was targeted by British soldiers who raided the town because it was a hotbed of patriot recruitment. The Reverend James Caldwell pastored the church. He was so hated by the British for his incendiary anti-Parliament speeches that he was targeted for assassination. No less than 36 army officers came out of this church and numerous other non-commissioned officers and privates. Reverend Caldwell is the same minister who is known for yelling, "Give 'em Watts, boys! 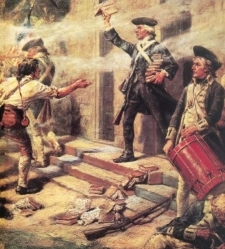 Give 'em Watts!," at the Battle of Springfield, when the American soldiers ran out of wadding for their muskets. Caldwell gave them hymnals by the songwriter Isaac Watts and tore the paper out for them to use as wadding. Both Caldwell and his wife were assassinated by the British by the end of 1781. The next most popular post of the last month was our post about the failed attack of Light-Horse Harry Lee and Francis Marion on Georgetown, South Carolina. Lee was a popular cavalry leader from Virginia who would serve in Congress, lead the 13,000 man army that defeated the Whiskey Rebellion during Washington's presidency and become the father of Civil War Confederate General Robert E. Lee. Francis Marion was called the "Swamp Fox" for his guerrilla tactics used against the British in South Carolina. His capture became one of the chief goals of British General Cornwallis in the south. On January 24, 1781, Lee and Marion led an attack to take the British fort at Georgetown, South Carolina. The British soldiers didn't resist because they hated their commander and the fort could have easily been taken. Lee's cavalry was late in showing up, however, which caused the rest to abort their plans because they thought the casualties would be too high without Lee's men. Despite this failure, both Lee and Marion would go on to have great victories in the Revolutionary War. The third most popular post of the last month was about Mary Ludwig Hays McCauley, otherwise known as Molly Pitcher. Hays was a "camp follower" who traveled with the Continental Army while her husband William served under General George Washington. Camp followers were women who did laundry and prepared food for the soldiers and tended to the sick. 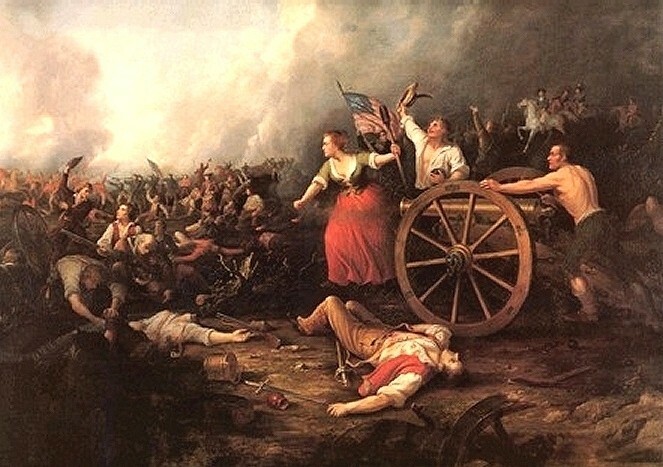 "Molly Pitcher" was a common name used for women who brought water to the men on the battlefield, both to drink and to cool down their cannons. Mary McCauley is famous for taking her husband's place at the cannons after he fell from heat exhaustion at the Battle of Monmouth Courthouse. She was nearly killed when a musket ball went between her legs and tore off part of her dress. George Washington himself noticed her and issued her a warrant as a non-commissioned officer after the battle. She went by the name "Molly" for the rest of her life. 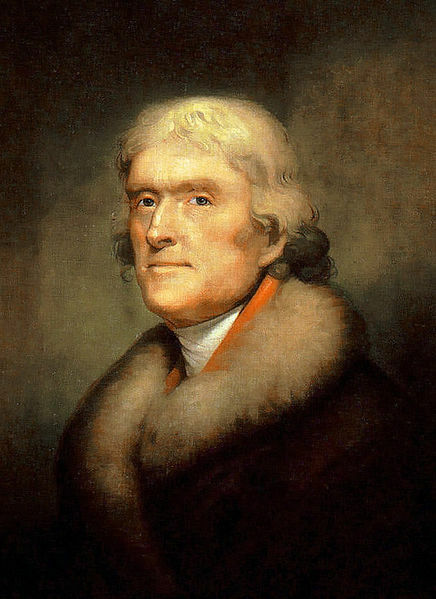 Who gave Thomas Jefferson the fur coat he wore in his famous portrait by Rembrandt Peale and where did it come from? Thanks to Mike Richette, a friend of ours on Facebook, for pointing this interesting fact out! The last edition's Question of the Month was: What holiday was the biggest celebration in New York City for a hundred years after the end of the American Revolution? The answer? Evacuation Day, which was celebrated on November 25 in celebration of the last British troops leaving the United States. You can read more about Evacuation Day here. 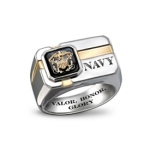 One of the more popular patriotic gifts we have on our website is our men's Military Jewelry. If you know someone who currently serves in the military, or did in the past, one of these rings, bracelets, keychains, dog tags, necklaces or watches might make the perfect gift. You can check out our Military Jewelry here.